Many of you asked me what I did with the food I made. If it is a meat dish, it usually ended up at Mr Wonderful. If it is vegetarian, I would share it with my vegetarian friends. Mr Wonderful once told me he had never eaten so much fruit and vegetable in his life. However I could not get him to eat a vegan pie. He loves pie. In his opinion a pie without butter, dairy and all, is not worth eating. His Grandma, mother and sisters were all bakers. They used to run a family diner in Northern MN and they made pies from scratch everyday. He once told me he "knew" pies. I didn't make the pie to challenge the poor man, I was actually asked by my friend Moni for a Vegan banana cream pie on National Banana Cream Pie day. I wanted to come up with something that she could enjoy with her husband, Steve. I was told that Steve loved Banana Cream Pie. I want to make sure I can preserve the taste and richness of the pie without the dairy and eggs. 3 of the key item I used: Coconut milk beverage, English Bird's custard powder and Rich Whip. 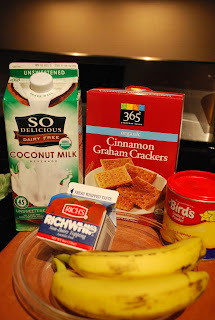 The coconut milk here is not a traditional coconut I usually use for cooking, it is an non-dairy alternative. I love the product. It has a hint of coconut. the same consistency of milk. It cooks very well. No many realize there is no egg in the custard powder, it is actually corn starch with some coloring. As with Rich Whip, it was the 1st non-dairy topping in the food industry!! Rich Whip is the only topping without any milk product. Many of the whipped topping do contain milk solids. 1 1/2 cup cinnamon graham cracker crumb, you can grind you own, it's about 1 inner package of crackers. Lightly spray a 8" pie pan with Pam or other non-stick baking coating. In a med size bowl, mix cracker crumb and sugar. Add melted coconut oil. Warm 1 cup of coconut milk in a small sauce pan till hot, but not boiling. Add the hot coconut milk to the custard mix. Keep whisking and cook the custard till thickened and coat the whisk or back of a spoon. Fold in 1/2 of the banana. Let the mixture cool in the fridge for about 30 min. It would appear to be very thick. In a med bowl, whip Rich Whip till stiff. Fold in add 1/4 cup of power sugar. Reserve a few pieces of the banana for garnish, evenly space the remaining banana in the pie crust. Pile the remaining topping on the pie. If you choose, you can pipe the topping on the pie. You can substitute Cool Whip or other whipped topping if you do not need the pie to be vegan. You're hillarious, i love it! Mahalo plenty! Just need to find that custard.